This page is a companion to the page describing various parameters that need changing in the NR class locos' ENG files to achieve more prototypical performance. In the first place, note that the 81s and 82s are EMD (GM) powered, so to be prototypical we need to refer to EMD data. Values for the NSW class 81 and class 82 locos were derived from the Australian Locomotive Page site at locopage.railpage.org.au. 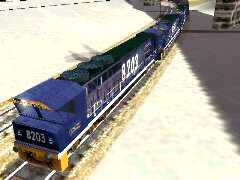 As well, reference was made to the Locomotive Physics work of Bob Boudoin, particularly for the EMD SD class locos, whose downloads from Train-Sim.com contain a great deal of information of changes required in various locomotive engine specifications to bring them to a more realistic operating level. You can see the list on the ENG, CVF & SMS files page. Aliasing will be used for the cab views and sounds in the updated ENG files so if you need to check what aliasing ia all about, look at Aliasing the SD60 In fact, we'll be using the SD60 cab for the Class 82. By referring to Bob Boudoin's work, particularly the ENGine file for the SD45 in sdphy41.zip, we could also alter other parameters, such as braking force, to achieve more prototypical braking. For the moment, we'll keep things simple. 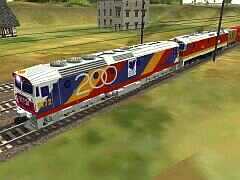 The SD45 ENGine file is referred to because it also runs an EMD 16-645E3 motor while the NSW 81 runs an EMD 16-645E3D. 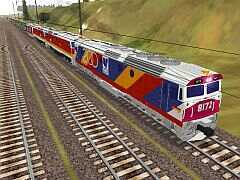 For the NSW Class 82, reference is made to an EMD SD60 because both locos have an EMD 12-710G4 engine. The 82 could be described as a powered-down SD60 (2435kw, versus 2800kw for the SD60). You may want to make backup copies of these files before editing: open Explorer and copy them into your MSTSBackups sub-folder. 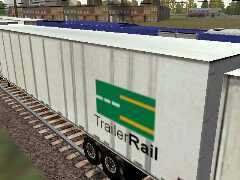 Note it's assumed you've downloaded and installed cabalias.zip from Train-Sim.com, as mentioned on other pages here. If you want a version of a GP38 cab with signal indicator, then download gp38bsig.zip from the Train-Sim.com file library. With a signal indicator, you can turn off the Track Monitor for most of the time and only use it to check speed restrictions on the track. Finally, we'll use the EMD SD40 sounds from EMD_SD40 under the Common.Snd folder. Once again, it's assumed you've downloaded and installed NALW's packaging of these sounds in emd40snd.zip. All that's left is to repeat these edits for the other Class 81 ENGine files. To see all the values webTrainSim has changed in the 8120 ENG file, click here to view the file in a new window (values in red are new). When webWiz downloaded the Class 82 from Australian Add-ons to MSTS site, the file was a WinZip file rather than a self-installing executable file to run. Looking at the list of files in WinZip, you'll see the ENG file is named class82.eng so create a sub-folder called class82 under your Trainset folder and copy the files. Unless you've also downloaded the wagon file (mentioned in the "readme"), don't copy the consist file but make your own after installation. The Australian Locomotive Page has all data we need, except for one value, namely, maximum tractive force. To get a value for this, webWiz referred to the value for the SD50 ENGine file from sdphy41.zip. 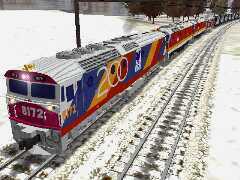 For 8203, we'll use the SD60 cabview. For help on downloading and installing the required files, see Aliasing an SD60M. Now save and exit WordPad. Start ConBuilder and make up an appropriate consist to do a test run. To see all the values webTrainSim has changed in the 8203 ENG file, click here to view the file in a new window (values in red are new). Friction, especially the first line. If you want more reading about this line of parameters, download Joseph Realmuto's fcalc_10.zip from Train-Sim.com. MaxBrakeForce. A more realistic value is 85kN (with reference to the SD50 and SD60 ENG values). Air brake system in general: recharge rate and capacity for example. Numwheels: this parameter occurs twice - see the info docs in sdphy41.zip for an explanation of how this parameter affects a loco's behaviour. Dynamic brake system: maximum force, operating speed range. A good reference to read about drawbar pull, horsepower vs. tractive effort, grades and braking, among other topics, can be found at Al Krug's facts & figures site.